Chair: manufactured by Evans, distributed by Herman Miller, designed by Charles Eames. 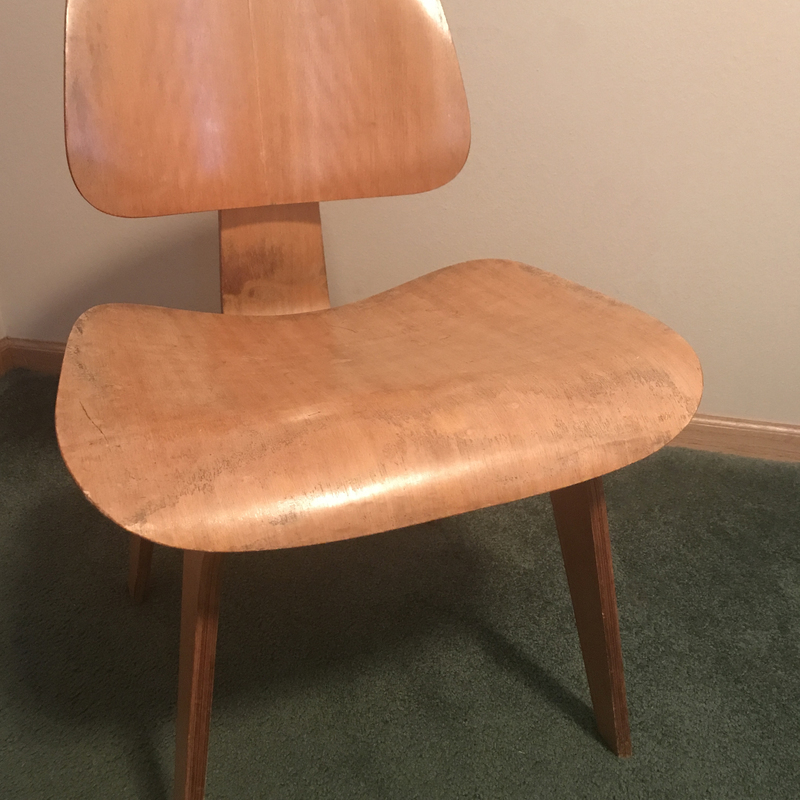 DCW - dining chair wood. 1947/1948. Seat 19 1/4 in .wide by 16 1/2 in. deep. Back height 28 3/4 in. and seat height 17 3/4.in. Depth of chair from back of chair to front of seat is 21 3/4 in.. This chair belonged to my Godfather who was its single owner. The appraised work is an iconic Eames Lounge Chair Wood (LCW), also known as the Eames Plywood Lounge Chair. It is perhaps the most successful and acclaimed design of the husband and wife team, Charles and Ray Eames. The chair was named by Time magazine as the best design of the 20th century. The chair’s unique shape was intentionally sculpted to fit the curvatures of the human body, providing a high level of comfort. The LCW introduced molded plywood as a new material suitable for furniture production circa 1946. The mass-produced, functional yet affordable chair was an instant success in postwar America. The chair has been in continuous production since the year of its introduction and it is still commercially available under the Herman Miller brand today. The estimate provided is based on comparables recently offered and sold at auction. In many cases, pricing for similar examples available on the primary (retail) market vary, and are usually higher than secondary (auction) market examples. Thank you for your appraisal. The only thing I would question is your comment that this is a Lounge Chair Wood (LCW). Based on the research I have done, the difference between an LCW and DCW are the dimensions. The dinning chairs have taller backs and narrower seats. The dimensions I listed are the same as advertising posters for the DCW of that time period and similar to other online examples which are stamped DCW. Many thanks for your comments. It appears I misread your original dimensions and yes, I would agree that the chair's measurements (as listed) fall in line with the DCW models. Apologies for my error. In terms of the estimate, I would still probably keep it the same based on DCW chairs offered/sold at auction and the overall demand, which is still quite high. The chair looks to be in good condition, based on the photographs you provided, so I see no need to adjust the original estimate. I hope this clears up any confusion, and I'm sorry again for the oversight.